A hand cleanser with�added moisturiser�to�gently clean your hands, without harsh abrasives or detergents. Mild enough for children to use, but will work equally well on women's or tough men's hands after a hard day outside. The gardener's friend hand cleanser. You've spent all day working outside. The garden/car/farm/home reno is looking great, but your hands certainly aren't! 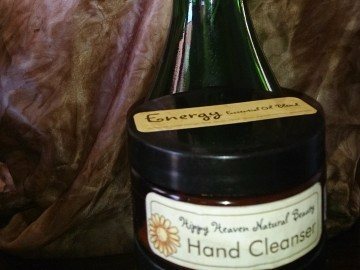 For thoroughly clean hands, left soft and gently nourished. Contains walnut shells in place of harse abrasives, combined with essential oils of rosewood, sweet orange, lime, lemon myrtle, lemon scented tea tree and peppermint to refresh and leave an invigorating scent.